Turkey! Cooking a turkey isn't that hard, you guys. It's just like a big chicken! The most important thing when cooking a turkey is to make sure it's totally thawed out before you try to cook it. The first year I cooked a turkey I was all ready to get it into the oven when I remember it was frozen solid. Ice cubes, man. It was a disaster. I ran it under cold running water for a long, long time until it was thawed enough to cook, but let me tell you, that was a mistake I won't do again. This is the most basic of turkey recipes. I didn't do crazy things like rub it with herby butter, brine it, or stuff it. Well, I did stuff some herbs and a lemon into it, but not stuffing. My turkey was 10 pounds. Yours might be bigger. Preheat your oven to 350. 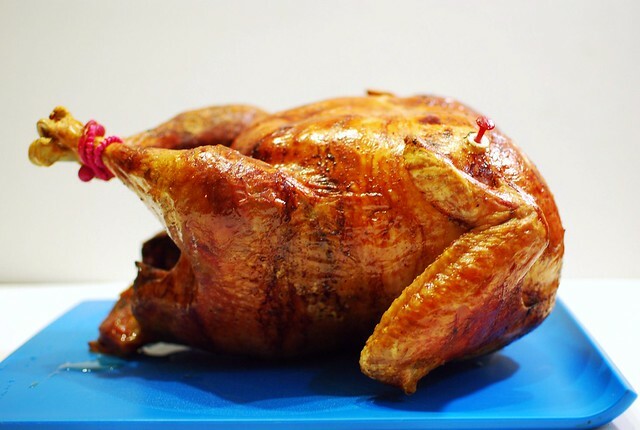 Remove the guts from your turkey, and stick them in the fridge for now. We'll deal with them some other time when we make gravy. Rinse the turkey, then pat dry. Stuff the herbs, garlic, and lemon into the cavity of the bird. Smear some of the butter of the turkey, sprinkle generously with salt and pepper. Tie the legs of your turkey together, and if you want, tie the wings down too. Place the turkey breast down and stick in the oven. Baste with melted butter every 30 minutes until the butter is gone, then baste with the pan juices. Flip the turkey after an hour. Cook 10-12 minutes per pound, until a thermometer reads 175-180 when stuck in the thigh. Let sit for 15 minutes or so before carving. man i hope my turkey this year looks this good. i will still eat it even if it is not photogenic.